Ever since we caught wind of the teaser back in September of last year, Alto’s Adventure ($4.99) has been an intriguing title. The biggest question I had was whether the game’s highly stylistic art style would be able to counterbalance a gameplay system that is essentially standard endless snowboarding fare. For me, I think the excellent visual style and soundtrack make for an experience that’s worth experiencing the otherwise basic endless gameplay. 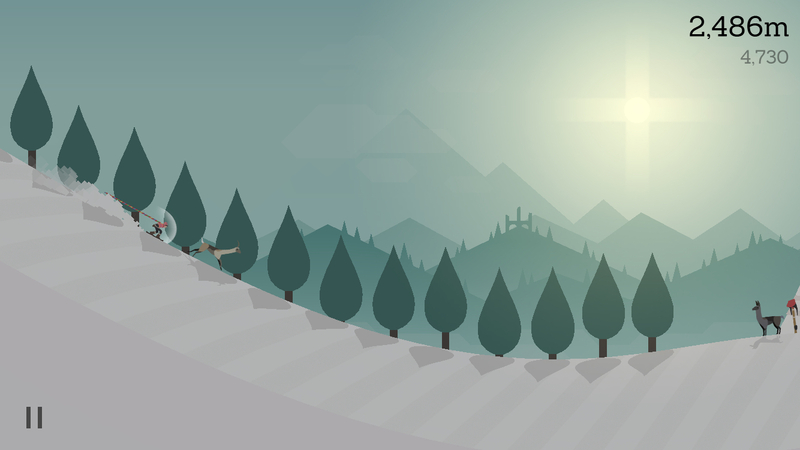 From a gameplay perspective, Alto’s Adventure shares a lot of basic tenets with a lot of other endless runners. The snowboarding mechanics are pretty reminiscent of the likes of Ski Safari ($0.99), while the majority of the power-ups, the objective-based quests, and currency collection/score mechanics are pretty standard. I did particularly enjoy its trick system, as it made even the easiest of tricks feel like an accomplishment. Otherwise, Alto’s Adventure does a good job executing all these genre staples and the physics-based gameplay is a nice touch, but it’s pretty easy to see that there’s not much here that truly innovates within the genre. 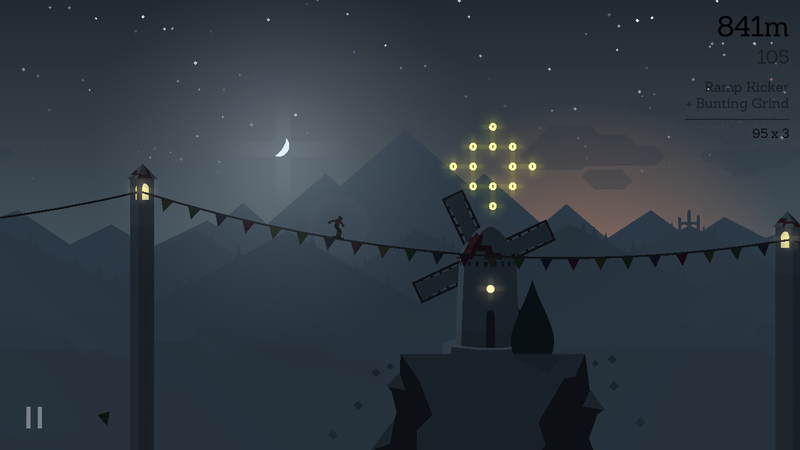 However, Alto’s Adventure didn’t earn its hype from its endless runner underpinnings. We’ve been keeping tabs on it due to its amazing art style and visual effects being employed. In these regards, the game absolutely shines. The procedurally generated terrain, dynamic weather effects (time also moves and is reflected in night/dawn/dusk settings) and full dynamic lighting make for an experience that looks simply beautiful. I found it pretty impressive how a change in weather or time of day can create a vastly different experience in Alto’s Adventure despite the fact that the actual gameplay doesn’t actually change. When you combine the visuals with an awesome mellow soundtrack, Alto’s Adventure creates a soothing comprehensive experience that feels like more than simply a game. I found myself becoming immersed in the setting, which is a feeling frequently sought but rarely experienced in similar games. Alto’s Adventure also does a good job of creating a sense of being within a larger world, mostly due to the large setting that you snowboard through that create a sense of scale with your small snowboarding avatar. It’s obvious that the developers focused exclusively in using its art direction and soundtrack to create an experience that’s bigger than the gameplay that surrounds it. It’s a tough act to accomplish, but I think Alto’s Adventure does a good job creating that premium experience. Sticking to the premium theme, Alto’s Adventure also does away with any semblance of IAP. There are a few simple upgrades that can be purchased in the game’s shop, but the currency needs to be earned the old fashioned way (actually playing the game). While saving up currency for said upgrades serves as some decent motivation to continually embark on new runs, I really didn’t think the potential upgrades were particularly special. If anything, I really just wanted to keep playing simply because I enjoyed the whole look and feel of the game. I imagine most folks will fall into two camps when it comes to Alto’s Adventure. The first will appreciate the sheer amount of artistic integrity and nuanced visual effects that the title employs and will play it just to experience those aspects. The second will largely ignore those aspects and see the game as yet another side-scrolling endless runner with pretty standard mechanics. Admittedly, if the production values and art style aren’t your thing, I can kind of understand some players looking past Alto’s Adventure. Personally though, I think those aspects are what elevate Alto’s Adventure above the vast majority of the genre and make it worth a recommendation in my eyes.